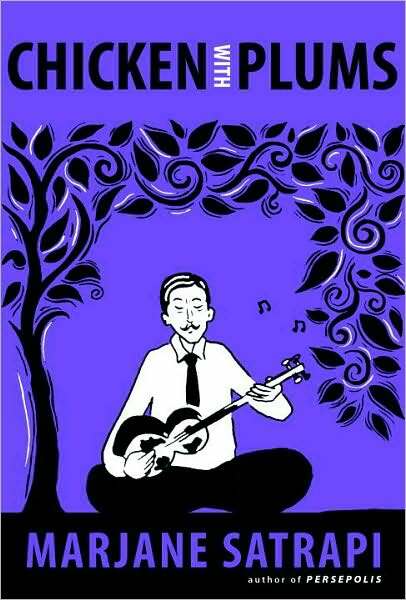 In Chicken With Plums, Satrapi writes a biography of her great-uncle, the famous Iranian musician Nassar Ali Khan. When Khan’s tar breaks, he falls into a depression and lays in bed wishing for death for a week. At the end of that week, he dies (this isn’t a spoiler, it says so right at the beginning). Satrapi presents each day of his final week, with flashbacks to earlier parts of his life that lead up to his current predicament. Through these memories, we come to understand Khan’s heartbreak and his loss of will to live. Oh my. This is the third book by Satrapi I’ve read, after Persepolis and Embroideries, and it has earned its place at the top of the list. At first, I wasn’t sure if I was going to like the book, but as the narration twisted and I came to understand more about a lifetime of frustrations, cyclical depression, and the outpouring of soul into music, I really empathized with Khan. Then, the end twisted around in a direction that I didn’t foresee at all, and I cried. It was beautiful. The love! The passion! The pain! Oh…and the artwork…so beautiful. The second to last panel, with the Angel of Death at the funeral, staring intently at a specific mourner – oh, it made me cry so much. It was such a lovely and heartwrenching book! I really, really love Marjane Satrapi’s work. Each new book I read, I love more. She has such a sense of character. She can take a person and strip them down to their essentials in order to splash out a portrait of them on paper. By the end of each of these books, though they aren’t long and don’t take long to read, you really feel like you know the people she discusses. You know them as individuals and you recognize in them the people you know personally. It’s brilliant. If you haven’t read any of her work yet, I highly recommend that you do. It doesn’t really matter where you start – they’re all wonderful! This entry was posted in 2009, Adult, Visual and tagged Middle East, nonfiction, POC, readathon, translation. Bookmark the permalink.